Standpoint has a feature called “Overrated” in which contributers take shots at people they think are overrated. Recent objects of scorn include Joe Biden, John Stuart Mill, and Edward Said. In November of 2008, Jeremy Jennings went after Slavoj Žižek. 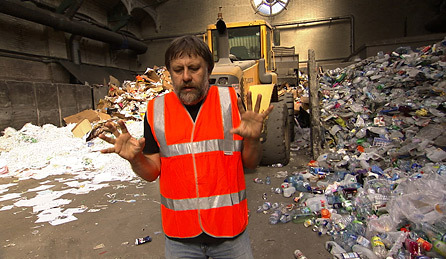 There is much to admire about Slavoj Žižek. He spent his early adult years as a dissident in the former Yugoslavia, suffering at the hands of the authorities. He refuses to play the conventional role of the leftist intellectual. He cannot abide orthodoxy, preferring the role of gadfly to prophet, jester to sage. He is hostile to postmodernism (describing himself as a “card-carrying Lacanian”) and despises the politics of multiculturalism for its reduction of all questions to problems of toleration and difference. He is rude to vegetarians and has no sympathy for humanitarians like Bill Gates, intent on solving the world’s ills through charity. It is at the very end of In Defense of Lost Causes, when he holds out the prospect of impending ecological catastrophe, that Žižek most clearly sketches the chilling vision of what he takes to be an emancipatory politics of “revolutionary-democratic terror”. First would be a strict egalitarian justice: the same norms of per capita energy consumption, carbon dioxide emissions, and so on, would be imposed on everyone. Next would be terror, including “ruthless punishment”, severe limitations on liberal freedoms, and technological control of “prospective” law-breakers. Third would be recourse to voluntarism in the form of “large-scale collective decisions” running counter to the logic of capitalism. Finally, all this would be combined with trust in the people, the wager that the vast majority of people would support these “severe measures” and would be “ready to participate in their enforcement”. Such would be egalitarian-revolutionary terror. It amounts to a reinvented version of the dictatorship of the proletariat. Viewed alongside Adam Kirsh’s Žižek hit job in The New Republic and Geoff Boucher’s critique of Žižek in The Charmed Circle of Ideology, do Jennings’s comments suggest the jig is up for Žižek, or are his rapidly multiplying legions of critics missing something crucial about the man and his ideas in their efforts to expose him as a fraud? Lacan was a narcissistic, pernicious fraud*; anyone Lacanian devotees are thus frauds by association. The only question is whether Zizek is fooling himself along with everyone else.